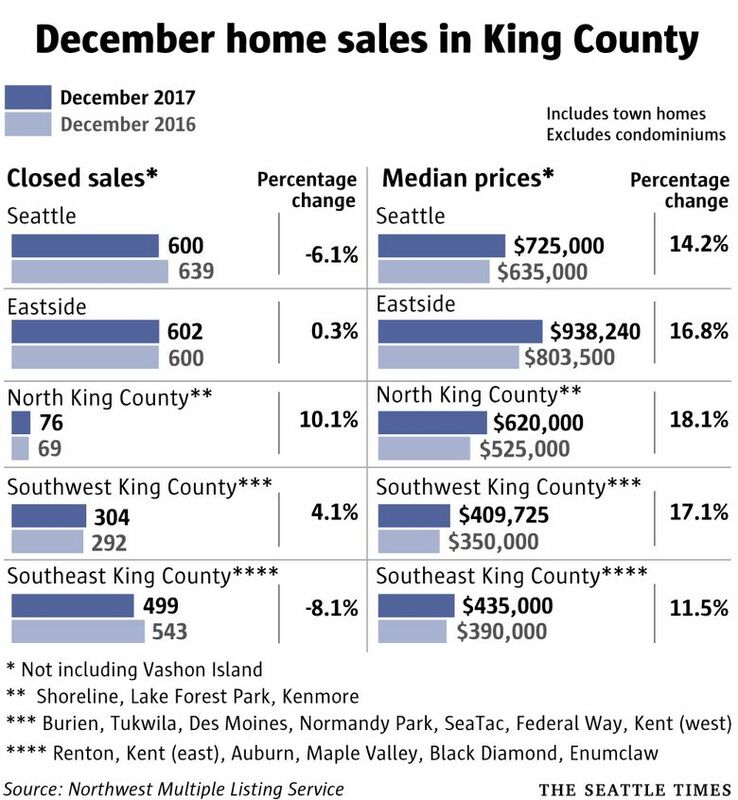 Single-family home prices on the Eastside, Seattle’s Capitol Hill area and Pierce County all broke record highs in December, as did condo costs across King County, during what is normally a slow time of year for homebuying. 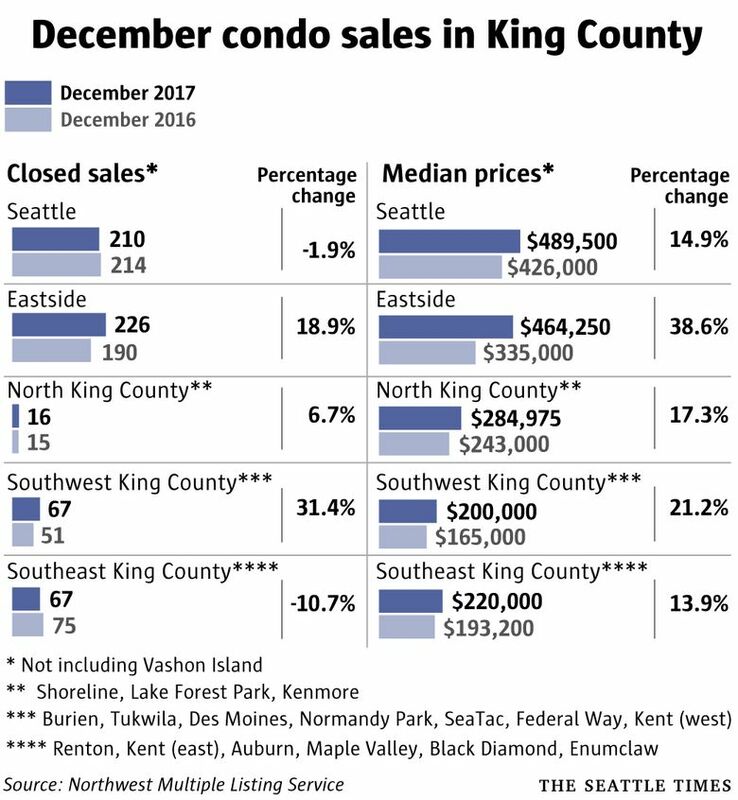 The priciest year in history for Puget Sound-area real estate ended with even more dramatic price increases — led by a zooming market on the Eastside, a median price that hit $1 million in the Capitol Hill area and a surge in condo prices across all of King County. The median single-family house on the Eastside soared to an astonishing $938,240 in December, smashing the old record of $885,000 set last spring, according to new figures released Friday. That means typical Eastside home prices grew 16.8 percent, or an extra $134,000, in just a year. Outside of a small dip in prices in the Redmond-Carnation area, everything else was red hot: Mercer Island, West Bellevue, the Issaquah area south of Interstate 90 and Kirkland-Bridle Trails led the way with increases that exceeded 20 percent year over year. Each of those regions now has a median home price that exceeds $1 million, with West Bellevue topping $2.5 million. The winter months typically cool down homebuying activity and prices, but not this time. What’s more, the King County condo shortage, which tightened throughout 2017, got worse again in December. There were only about 200 condos available across the county last week, another record low, after plunging 40 percent from a year ago. Condo prices shot up a remarkable 28 percent from a year ago, the most in 4½ years. The median condo sale countywide surpassed $400,000 for the first time, reaching $402,000. That beat the previous record, $385,000, set last spring. Buyers priced out of the single-family home market continue to seek out condos, while developers on a record high-rise construction spree have mostly ignored condos to build rental apartments, which are a safer bet financially. The rest of the housing market was hot, again. Across all of King County, the median single-family home cost grew 15.5 percent from a year earlier, according to the monthly sales data released Friday by the Northwest Multiple Listing Service. That’s similar to the increases seen throughout most of 2017. Prices countywide even ticked up slightly compared to the fall months. But the median countywide price of $635,000 remained below record levels seen last spring and summer. In Seattle, the median house price grew 14.2 percent year over year, to $725,000, also below the high mark from last spring and summer. West Seattle and the central area that includes Capitol Hill led the way with one-year price hikes that topped 30 percent. The median price on Capitol Hill and Madison Park reached $1 million for the first time. That region roughly spans Seattle homes north of Interstate 90 and east of Interstate 5. It’s the second region in Seattle to hit the seven-figure mark after Queen Anne-Magnolia, which first did so last June. As rising home prices became routine in 2017, so did plummeting inventory: The number of single-family houses for sale across the county fell another 29 percent in December from the previous year, reaching a record lowsince records began in 2000. There were a mere 1,168 homes available countywide as of last week, less than half the number on the market on the New Year in 2015. Much of the low selection is due to homes selling quickly, but another factor is that fewer people are putting their homes up for sale. Discouragingly for home shoppers, the number of new listings dropped in December from the previous year after slight upticks in the previous couple of months. Yet again, there was no relief for people looking for a deal farther away: Single-family home costs rose by double digits in the three nearby counties. Snohomish County: Prices grew 12.5 percent from a year ago, to a new median price of just under $450,000. Pierce County: Home costs increased 12.3 percent in a year, reaching nearly $320,000. 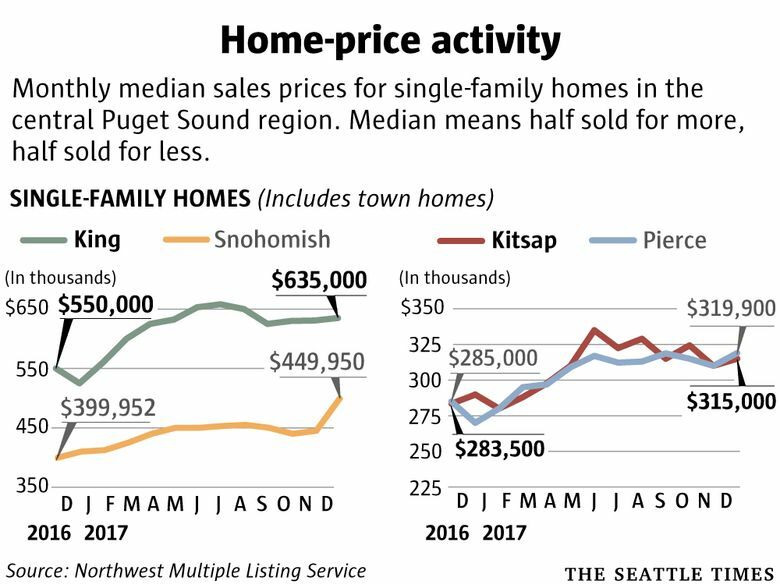 Kitsap County: The year-over-year growth was 11.1 percent, with the typical house going for $315,000. All three counties also bucked the normal seasonal trend, getting more expensive compared to the previous month. And Pierce County actually set a record for home prices. Most economists, brokers and housing-data companies that put out annual forecasts on pricing are predicting a slight-to-moderate slowdown for Seattle-area cost increases in 2018, with prices still rising sharply but not by as much as they did in 2017. Then again, they largely predicted the same at the start of 2017 but were proven wrong: The market stayed as hot as ever, leading the country in increases all year.